Effective channel marketing today requires an increasingly high level of engagement between your channel partners and their prospects. Whether marketing is done by a partner or by vendor, traditional methods such as email are no longer generating the same results. Channel marketers who provide retargeting to their partners offer an advantage over their competition because it is a reinvigorating form of advertising that focuses on an already interested audience. Retargeting is an automated, consistent way to remain in the forefront of a prospect’s mind, even after he or she has left your partner’s website. This marketing tool is always active and provides the channel marketer with an opportunity to gain new customers, qualify leads and maximize ROI. According to online buying research, only 2% of visitors make a purchase on their first visit to a website. Additionally, whether it be a downloaded article or a subscription to a newsletter, only 4% of website visitors leave a website having completed a desired call-to-action (CTA). This means that over 90% of visitors are interested enough to visit your website, but are not yet engaged enough to make a purchase or complete a CTA. The problem then arises: how does a vendor and/or partner capture, engage and ultimately convert even a portion of the remaining 90% of visitors? One possible answer is retargeting. A vendor sells IT products that Prospect A has interest in. The vendor sells through its resellers, and each reseller has a different microsite where prospects can visit to make a purchase or complete a desired CTA. However, due to a lack of engaging content, an inability to make a purchase or some other obstacle, Prospect A does not make a purchase right away. Luckily, the microsite has retargeting code built in. When the code is activated, a banner ad for a local reseller is displayed, thus increasing the visibility of your company while engaging Prospect A. She clicks on that banner ad and is brought to a form, landing page, video or other lead capture tool where she can complete the desired CTA. By placing display or banner ads across the internet, it helps convert a highly targeted and already interested audience. The available reminders help to recapture the mindshare of previous visitors and continue to market towards them until they are ready to purchase products or services. 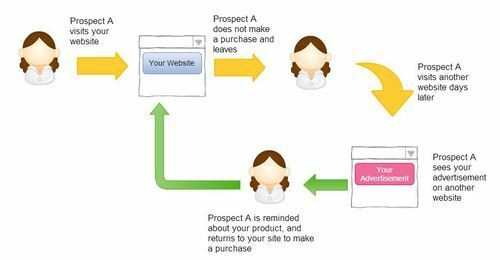 Take a look at the image below to see how retargeting works. So why retargeting? Retargeting is effective because it focuses advertising efforts on prospects who we can assume are already interested. If a prospect has already visited a vendor or partner website, it’s safe to assume they have a higher-than-average interest level. The goal is then to get the prospect engaged enough to complete a CTA and ultimately make a purchase. By having display advertisements appear on other websites, retargeting helps improve the marketing clout of your company. Want to incorporate retargeting into your current channel marketing capabilities? Utilizing a consistent, automated marketing tactic like retargeting gives a channel marketing program an advantage in the competitive world of digital advertising. Pairing retargeting with display and banner ads, as well as with content marketing, can create new opportunities that a vendor or channel partner never knew were available. Allow StructuredWeb to create and automate any marketing campaign and maximize your ROI in the process. We offer 15 different marketing tactics to promote your channel, including retargeting, content syndication and display and banner advertising syndication. If you are interested in expanding your channel marketing capabilities, please contact us. This organization utilized retargeting to recapture the interest of these past visitors and commence nurturing to re-engage them. They commenced by identifying key segments which differed in their level of intent as a business lead. They bid more aggressively on ads the higher the level of intent of each type of visitor to their site. Within 20 months the organization had seen a 50% increase in repeat visitors, a 300% engagement rate increase – time on site grew to 5 minutes per visit – and a 51% increase in conversion as evidenced by visitors submitting lead capture forms.